We were very touched when we received this e-mail yesterday from the wonderful person who gave Marie, a very senior Dachshund that came into the Shelter's care in October 2008, a better life than any dog could ever hope for. Marie was quite old back in 2008, so the fact that she lived so long is a true testament to Marie's mom. One of our volunteers named her Marie in honor of a dear friend that had just lost a long battle with cancer. It is with terrible sadness that I'm letting you know my precious little Marie lost her long and courageous battle with cancer the morning of May 22. Thanks to the very risky surgery her wonderful veterinarian and friend Larry Venezia performed in April 2010, and an additional surgery in July, this brave and beautiful little girl enjoyed over 13 happy extra months of life. Each and every day spent with her was a precious gift. With lots of love and the very best of care, she went from fearing that hands were going to hurt her to believing that every hand held a treat for her, and she would nibble your fingers in anticipation. She went from emaciated former stray to a solid 12.2 pounds. She also went from being terrified of riding in cars to being the first one at the door whenever she heard the keys jingling. Watching her complete turnaround was one of the most incredibly heartwarming experiences of my life. I've attached one of my favorite photos of Marie, taken last November. I think it captures her spunky personality beautifully. Marie touched the hearts of everyone she met, with her precious frosty face and huge dark brown eyes. I would often catch her gazing lovingly at me even when she didn't know I saw her doing so. She approached each new adventure (and everything from taking her daily medication to getting an ultrasound exam was an adventure to her) with the enthusiasm of a puppy. I am heartbroken, and miss my little girl so much, but I know her spirit is still with me and still touching the lives of all who knew and loved her. 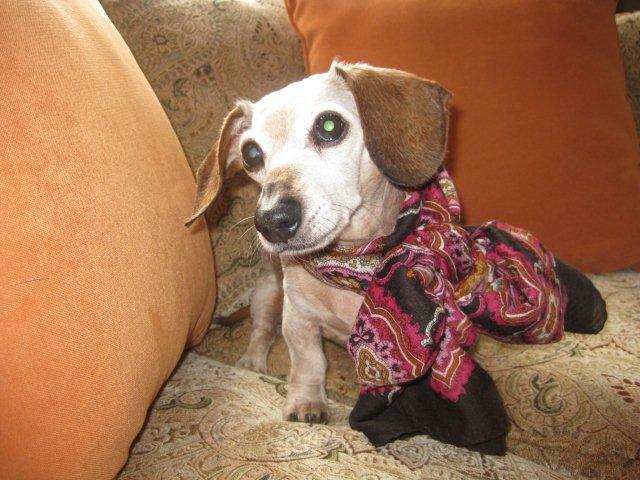 I will forever be grateful that you contacted Joni from Coast to Coast Dachshund Rescue when Marie was at your shelter. She was truly a precious gift.